November is not the time of year you normally find me hiking, but Kerry was in town and so we decided, rain or shine, we would hike in Mount Rainer National Park. It is sad to admit that while I live in the Pacific Northwest, I have never been to Rainer National Park. So we took off on Friday night, and headed south. We stopped at Crockett’s Public House in Puyallup, WA for a great dinner. The highlight was the grilled artichoke, which was smokey and tender. Then on to the Nisqually Lodge in Ashford, WA, just outside the Nisqually Gate of Mount Rainer National Park. We were up early on Saturday morning, pulling on all kinds of layers and stuffing rain gear in our packs. The forecast was 100% chance of rain at 11:00 am. We headed out without breakfast, but with a notion that we would get into our nice hike, have a protein bar on the trail and then have an early lunch. We were on the road and in the park before sunrise. We entered at the Nisqually gate, and were headed to Paradise information center. But, the gate at Longmire was closed, not set to open until 9 am. It was 7:15 am. Luckily, there is a lodge and restaurant at Longmire, and so we stopped for that skipped breakfast while we waited for the gate. The waitress there was very helpful. She had lots of tips on hiking and trail maps. 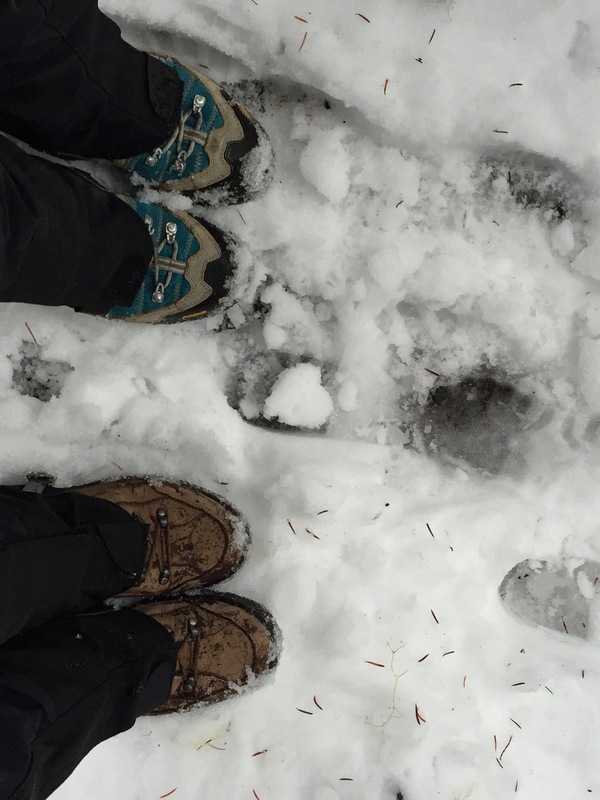 When she found out our plan was to hike the Skyline trail loop, she asked if we brought our snow shoes… what??? Yep, 16 inches of snow on parts of the trail. Looking at each other, Kerry and I started to rethink our plans. Snow. Kerry, Karen and myself attempted to summit Humphrey’s peak in AZ early one spring and after 5 miles of sinking to our hips in snow, we lost the trail and turned around without summiting. So we started to rework our plan. 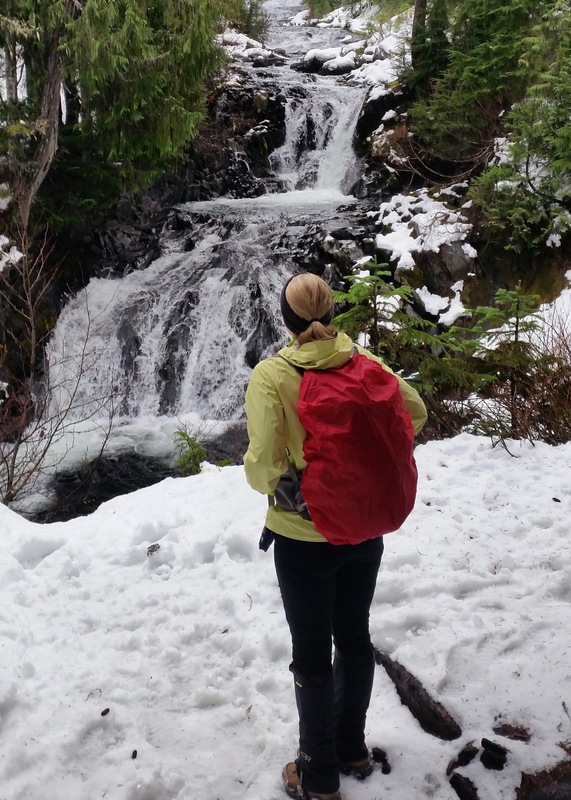 After looking at some of our options we decided to hike part of the wonderland trail from Longmire to Paradise. Our helpful waitress assured us it was 6 miles one way and looked to be a good hike. Round Trip was twice the distance we originally planned on, but we knew we had the option to turn around half way. The first part of the hike was fabulous; the trail was smooth, few roots or stones to tub your toes on, and at every fork in the road, we found plaques with trail names and distance markers. Our first stumbling block came at about mile 2 after passing the cut off to the Cougar Rock camp ground. The note on the trail marker was that the bridge over the Nisqually River was washed out. We really did not want to take the road, and so we decided to go investigate the river. We never did find the washed out bridge, but we did find a few rock piles that helped us over the river, and then a felled tree that allowed us, with a bit of a jump, to get over the deepest part of the river. I won’t lie, the river crossing brought on nerves. Furthermore, in looking back we realized that coming back would be a lot more difficult. And dangerous if it started to rain and the river started running. But, we had a back up plan in our back pocket so we went onward! 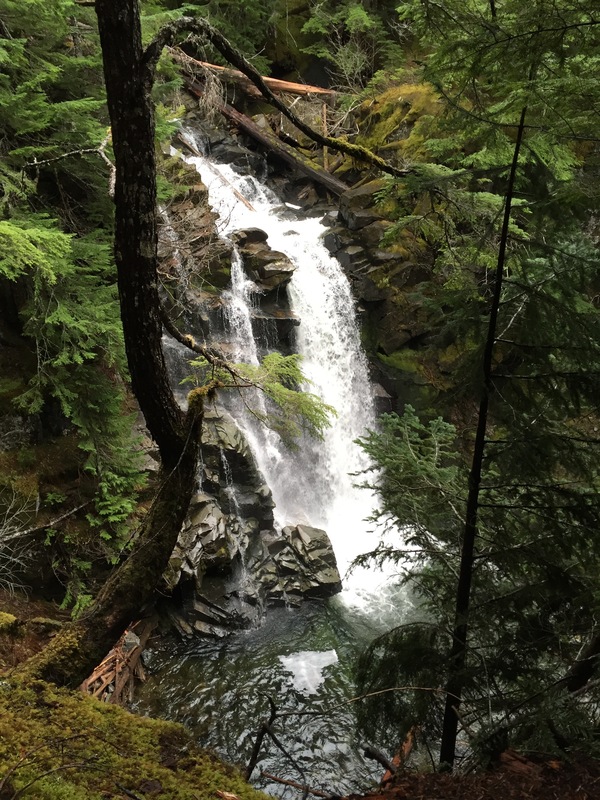 After another mile of hiking through a beautiful canopy of tall pine and spruce trees, became upon Carter falls. Honestly, this is like being in a fairy wonderland. Only a short hike further were the Madcap falls. With no intention of turning around, we decided we could make Paradise, so onward we went. The rain started, but the canopy of trees sheltered us for a while. Eventually we had to put on all the rain gear to keep from getting too wet and losing too much heat to the elements. And we started to see snow patches along the side of the trail. Another 2 miles after the MadCap falls, we heard and then saw the Narada Falls. It was at this point that we were standing on a slight layer of snow. But we decided to continue. 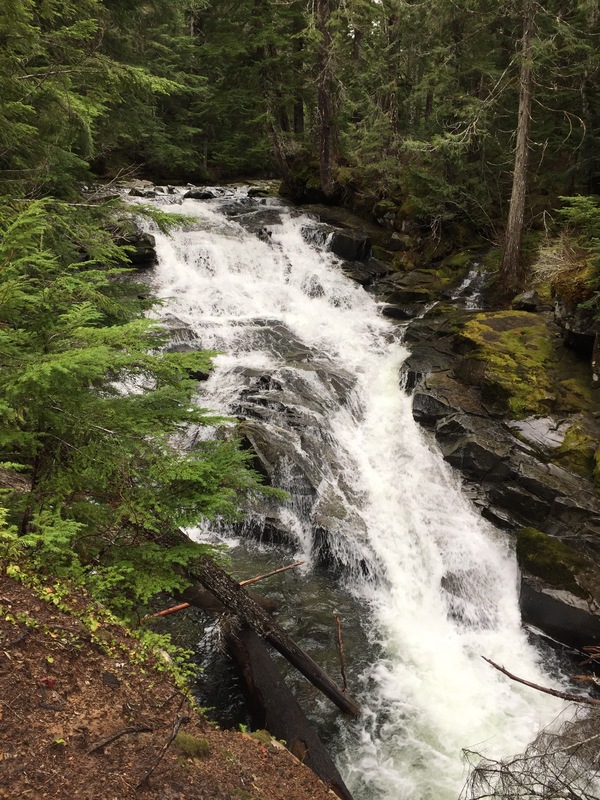 When we got to the top of the Narada falls, the trail intersects the auto road and we ducked into the restrooms to adjust our gear and look at the map. By now the rain was steady and the trail was deep in snow. We were following the footsteps of hikers that came before us. We had .7 miles to make it to Paradise when we lost the trail. Trudging through deep snow and with no footsteps to follow, we knew something was wrong. We retraced our steps, found our wrong turn and looked at each other. We hiked at least a half mile in deep snow on our “detour” in the wrong direction. It was now raining steadily and we no longer had a canopy of trees to shield us. 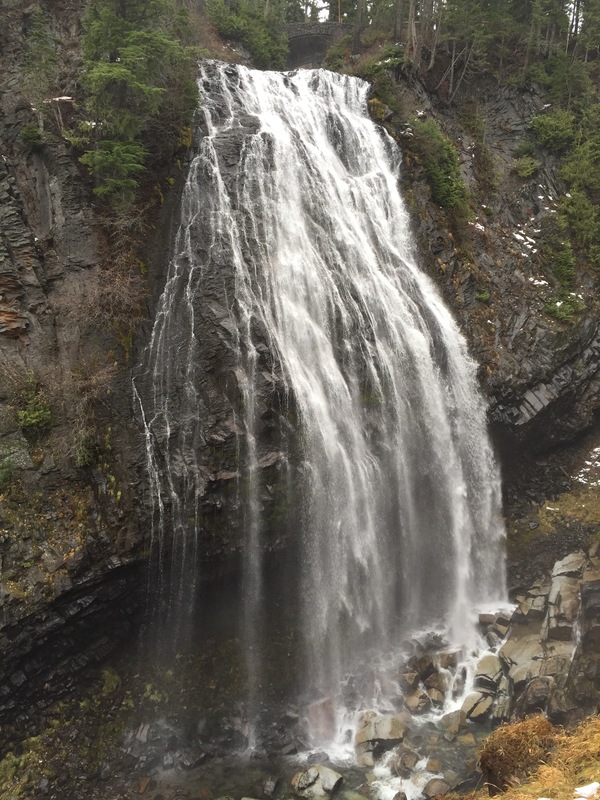 We were close to the Narada Falls, where a lot of tourists pull over to see the view. We stopped there and met two lovely people, mother and son, who’s family had history in the Mount Rainier area. We got to talking and they offered to drive us back to Longmire since the rain was steady at this point. Not wanting to cross the river without a bridge in these conditions, Kerry and I accepted. So we ended up hiking just over 5 miles, but in the snow and rain, we decided that was good enough for the day. Back on the road at 12:30 pm after visiting the General Store at Longmire. 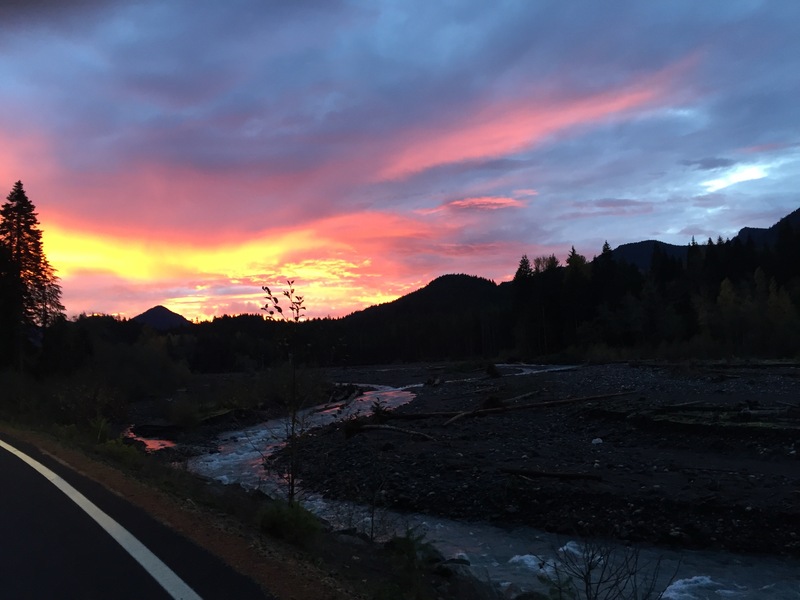 Call the visitor center/rangers to find out road and trail conditions and restrictions before you visit.